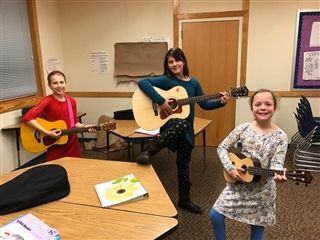 Private music lessons are encouraged for all students. Our teachers are experienced with teaching beginning, intermediate and advanced students. Available lessons include piano, voice, guitar, ukulele, bass, recorder, flute, violin and viola! Lessons are 30 minutes each and meet once per week. Lessons are paid by the semester. Students have up to three weeks to drop lessons. Students who decide not to continue will receive a refund of the amount paid minus the amount for lessons already received (up to but no more than three). Lesson fees are NON-REFUNDABLE after the first three weeks. Lessons are scheduled only when classes are in session. Please review Duke School’s 2018-19 skeleton calendar for days when classes are not in session. Lesson time slots are limited and assigned on a first-come-first-served basis. * TO REGISTER, please e-mail individual teachers to receive the days and time of your lessons. Once you've made a schedule, your teacher will send you a registration e-mail. Rates applies for teachers Hal, Maureen, and Loren only. Interested in private music lessons? Now is the time to sign up! We have very limited slots available. For lesson availability, please contact the instructor by clicking on their name below. For all other questions, please contact Foley Dyson.